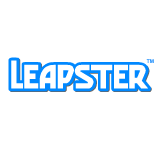 The Leapster was an educational games console meant exclusively for young kids, powered by the magic of Macromedia Adobe Flash. It appears to have done decently well for its purpose, having a couple of upgrades along the way. A simple diagnostics screen can be accessed by holding down all of the console's buttons and powering it on. 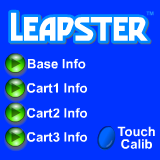 Here, the user can calibrate the touch controls and get information about the cartridge inserted. Verify if this is how you access it. Once this is confirmed to be accessible, get a video capture. When the user has entered Diagnostics mode, hold the Hint, A and Down buttons at the same time to go here instead of the above menu. To progress through the screens, hold the aforementioned buttons down and press the B button. This will show various staff member photos, including a crowd shot with all of the developers. 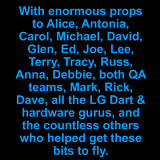 Right at 0x100 in the BIOS is a small message. Lil ducked. The jet zipped past her head. Dust flew, Lil sneezed, and Leap turned red. Then Lil got up, about to yell. Leap gasped, "Look, Lil! Your tooth! It fell!". 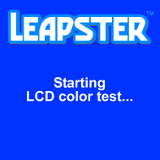 been approved by LeapFrog. Nothing in these five sentences implies permission to copy them. Leap likes his ABCs more than his 1,2,3s. This page was last modified on 15 August 2017, at 22:48.